Today I took Moët for her hip x-ray. I was so nervous, even though I was expecting a good result. She is so agile and athletic, and loves to jump. In the forest she is like a dear, flying over stones and trunks in full speed. But you never know. The result: A hips! 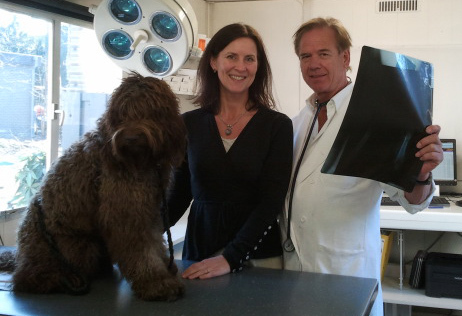 This veterinary is a specialist in hips and judges hip photos at the Dutch Kennel Club. Therefore one gets the result at once, which is a very big advantage. The waiting is otherwise nerv wracking. Another advantage is that there is no anesthesia needed. This vet has a cradle in which the dog lays for the photo to be taken, being held by three persons. Moët did so well in this peculiar situation. Even the second time (first photo was too dark) she did not panic, but let herself be placed in the cradle and accepted to be forced into the right position. 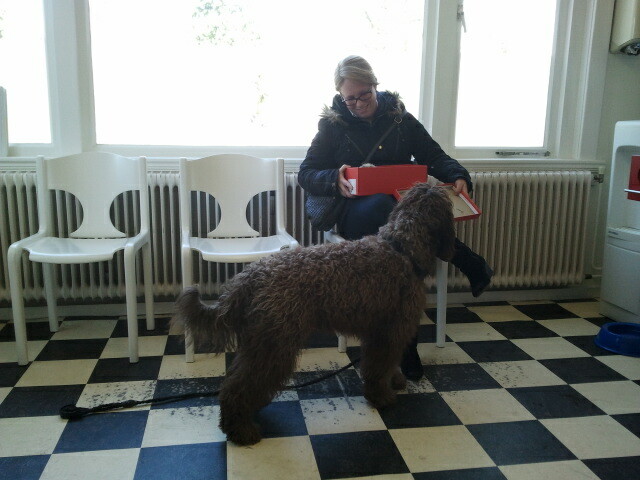 In the waiting room - an old guinea pig in a box!